I've never been a huge fan of coconut. I started making these one day after making some custard and having egg whites leftover. I didn't want to throw them out so I searched around and came across this recipe on AllRecipes.com. These are very easy to make, quick to put together and were very good. This time I had made these to giveaway to some family. Make sure you keep them in an airtight container otherwise they dry up and get hard. I had put them in some cellophane bags and they had hardened up. You can remedy this by popping it in the microwave for about 10 seconds. They are great snack for kids too. These would also be great dipped in some chocolate or with some drizzled on top. Preheat over to 325 F.
In a small bowl, mix together coconut, sugar, flour and salt. Add the egg whites and vanilla. Mix until all incorporated. On a parchment lined baking sheet, drop by rounded teaspoonfuls. Bake for 18-20 minutes or until golden brown. Transfer to a wire rack until cooled. Keep in an airtight container. Love these a lot,delicious ones!! Thx....photography is a work in progress...have a lot to learn! I would prefer to keep the word verification up to prevent spam. I haven't gotten any msgs from anyone else about problems commenting. Have you tried using a different browser? That may help. I love macaroons. Yours look great! Great minds think alike :) I love macaroons and coconuts.Yours look really good! Ive been seeing a lot of coconuts out there this week...is there a coconut entry running somehwere? ?/ lovely preparation i love coconut macaroons with the sweet and the crunchy! I am a coconut lover and love these cookies! 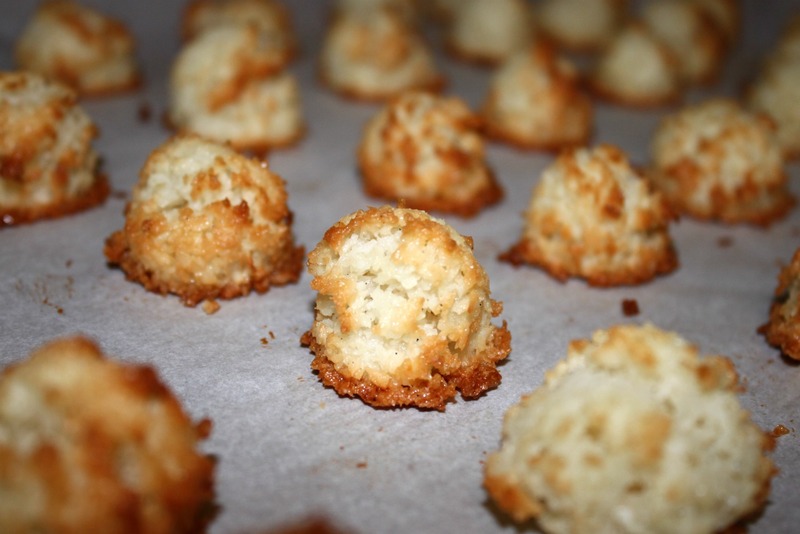 Oooh...coconut macaroons are my favourite! So coconuty and delicate. Love it. Vanilla assence isn't halal!!!! Though!!! You are absolutely right...vanilla extract is not Halal. I don't use it and should not have written it in the recipe. Thx for catching that. I will update they recipe to remove that.